Graduations, Retirements, Moves, Oh, My! I know I have already mentioned how busy our members are in the spring and it isn't like I need to remind you either, BUT I just want you to know that even though I have been gone from the district office for many years now, I still remember what you are going through! And is it my imagination or do district offices have a real tendency to move special education offices more frequently than other departments? One of the areas of my responsibility when I was Assistant Superintendent was the safety procedures of graduation. I can tell you even after 12 years, I still break out into a cold sweat over the thoughts of 5 graduations being held in a large arena over a 24 hour period! We never had an incident but almost every year someone would suddenly recall some student made a threat about graduation back in October. The investigation would be done and every "t" crossed and every "I" dotted, but I never rested until the last graduation was over and the building was empty! But I also remember my last graduation and the joy and fulfillment I felt when one of the graduates was a young lady who had entered our preschool program the year I took the Assistant Supt position. She had grown into a beautiful, smiling employed young lady — it truly is a great job! So, as you deal with all the "stuff" that goes along with the closeout of school, remember there really is a good reason you do what you do ... and he or she has a name! Professional Associations are critical tools for your job. 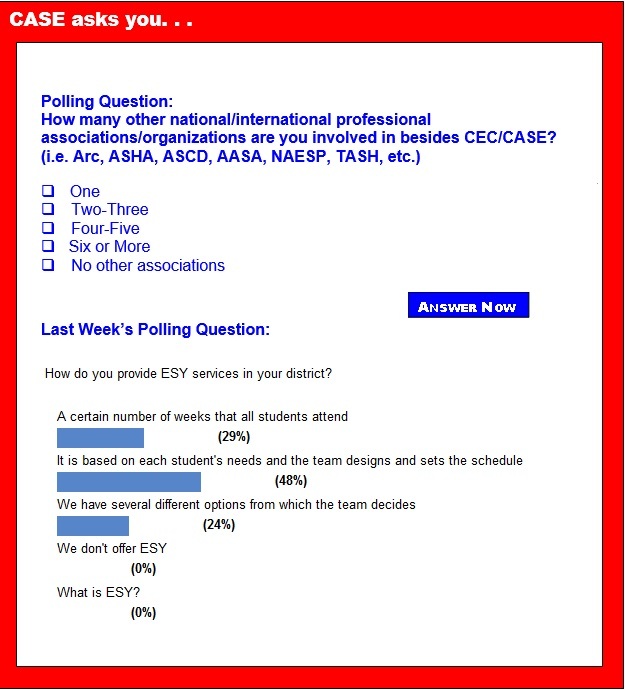 This weeks' poll asks how many professional associations you are a member. We know you have many options and we appreciate those of you who are CEC/CASE members. We know many of you are also members of other divisions within CEC and we know you also most likely belong to several state level organizations. But this week we are asking how many other national/international associations you belong to besides CASE/CEC. I will tell you that I belong to 4 other national/international associations, which is actually down by about 3 over when I was an assistant superintendent. Why do we belong to so many organizations? I pay those dues for the member services I receive which includes but is not limited to great content in the newsletters, websites, blogs and journals; the collegial networking; the quality professional development opportunities; and of course for the opportunity to make a difference through collective advocacy efforts! One of those membership benefits from CASE is the CASE Educational Legislative Leadership Summit, July 13-16. Have you got a team attending the 12th Annual CASE Educational Legislative Leadership Summit, July 13-16? If not, make sure your state is represented in July. Go to the CASE website to register and click here for the flyer. This year as every year, it is very important for CASE to have as many different states represented up on the Hill for our visit on Tuesday, July 15. There are several really important national issues we will be working on in DC this year with our other association partners. Don't miss this great opportunity. And, with a hotel group rate of $149 at the Hilton Old Town, right across from the King Street Metro stop, this might be a great time to do a DC excursion for you and the family! Group rate ends June 17 so click here to make your hotel reservations! Click here to download a flyer. And Don't Forget the CASE Career Center! If you haven't visited the CASE interactive job board at the CASE Career Center, now is a good time to do so! With its focus on special education administrators and professionals, the CASE Career Center offers members, and school districts, a highly targeted resource for online recruitment. Both members and nonmembers can use the CASE Career Center to reach qualified candidates. Employers can post jobs online, search for qualified candidates based on specific job criteria, and create an online resume agent to email qualified candidates daily. They also benefit from online reporting providing job activity statistics to track each job posting's return on investment (ROI). Alec Falconer knew for years that he had a problem with words and letters. The young man who is now in ninth grade struggled in school for nearly a decade before his learning difficulty was diagnosed as dyslexia. The Collaboration for Effective Educator Development, Accountability, and Reform Center, a new national center funded by the U.S. Department of Education Office of Special Education Programs, is seeking state partners, including state departments of education and teacher and leader preparation programs to work collaboratively to promote, support, and reinforce teacher and leader effectiveness across the career continuum and thereby ensure that students with disabilities achieve college and career readiness in inclusive settings. CEC serves as an association partner on the CEEDAR Center. With nearly 6,000 charter schools serving 2 million students throughout the country, the House of Representatives passed legislation to update the over $250 million federal charter schools program. In a demonstration of strong bipartisan support, the Success and Opportunity through Quality Charter Schools Act (H.R. 10) passed the House by a vote of a bipartisan vote of 360-45. While educators are required to use evidence-based practices, the legislation that supports their availability often attracts less attention than other major education initiatives. Even though its reach is broad and need is great. The U.S. Department of Education announced a new priority for applications for Educational Technology, Media and Materials for Individuals with Disabilities-National Center on Accessible Educational Materials for Learning. When children struggle with focusing on tasks, staying organized, controlling their behavior and sitting still, they may be evaluated for attention-deficit/hyperactivity disorder. Clinicians, however, shouldn't stop there, according to a study presented at the Pediatric Academic Societies annual meeting in Vancouver, British Columbia, Canada. Researchers found that many children with ADHD also face challenges such as poverty, divorce, neighborhood violence and substance abuse among family members. Over the past four years, Samantha Ovadal has been bitten, hit, kicked and scratched while working as an education assistant at a Maplewood, Minn. school that serves students with severe emotional and behavioral disorders. Yet Ovadal loves her job, and dreams of becoming a special education teacher. The only things standing in her way are the time and money it would take to pursue her master's degree. Most likely, she would have to quit her job, creating another difficult-to-fill classroom vacancy. But a first-of-its-kind University of Minnesota master's degree program promises to groom education assistants such as Ovadal into special education teachers by training them on the job in the classrooms where they already work. Alec Falconer knew for years that he had a problem with words and letters. The young man who is now in ninth grade struggled in school for nearly a decade before his learning difficulty was diagnosed as dyslexia. Dyslexia is a language processing disorder that can hinder reading, writing, spelling and sometimes even speaking. "When I first found out I was dyslexic I was a little stunned," said Falconer. "During elementary school and middle school, I've never had to write in cursive. My teachers let me just write in print," Falconer said. But for those with dyslexia, cursive handwriting can be an integral part of becoming a more successful student. Do states need a Common Core check-up? Resources and tools for Common Core abound, but it's time to gauge how implementation is really going, according to some stakeholders. Part of that motivation, according to the Chief Council of State School Officers, is to obtain an accurate picture of states' efforts amid the vigorous support for, and backlash against, the Common Core State Standards. CCSSO, which has led the creation of the Common Core along with the National Governors Association, partnered with four state education leaders to examine those states' progress. No Child Left Behind Act waivers — initially billed by the Obama administration as a collaborative effort to help states get beyond the outdated NCLB law — have moved deep into the compliance phase, leaving states and the U.S. Department of Education to negotiate over the finer points of plans, rather than discussing big-picture policy ideas. The details, however, can prove make-or-break for states, which risk losing their flexibility altogether if they can't come to an accord with the administration. Many who advocate for perpetual increases in education spending believe that greater K-12 funding leads to better educational results. But looking at states across the nation shows this is not the case. In fact, most states that spend less on K-12 education than Michigan perform better — many significantly better. And analyzing gains in the National Assessment of Educational Progress show that lower-spending states are making the largest educational gains. Dyslexia makes reading and other language-based tasks difficult, but it can also affect your child's social skills. Here are five common social challenges your child with dyslexia may face — and ways you can help. Increasing evidence shows that stigma — whether due to a child's weight, sexual orientation, race, income or other attribute — is at the root of bullying, and that it can cause considerable harm to a child's mental health. Experts in pediatric mental health, bullying and ostracism gathered for a symposium titled "Stigma, Ostracism and Bullying: Dangers, Prevention and Interventions" at the Pediatric Academic Societies Annual Meeting in Vancouver, British Columbia. Researchers will present evidence of stigma associated with various attributes and the harm it poses to children through bullying, ostracism, and discrimination. Let's talk about testing. "I want to," said Bob Bender, principal of Public School 11 in Chelsea. "I want my voice to be heard about how outraged I was about the exam." So by all means, speak up. He sighed. "I can't go against the state embargo," Bender said. By state order, teachers and principals may not disclose any contents of the three days of standardized English tests that were given at the beginning of April. Could it be the boy crisis? A new international study released last week shows that during the past 100 years, the first in which girls have been educated en masse, girls have out-performed boys academically. I'm not going to write here about what that may mean in terms of what grades are rewarding or about how that fact hasn't led to the dismantling of institutional male dominance. This is just about math and what our persistent gender gap means.